Separation anxiety is a perfectly natural part of child development, but it can be very hard for parents to leave when their children are in distress, causing both generations a great deal of stress. Understanding the nature of separation anxiety can help parents and caregivers to work together to ease children through this sometimes difficult problem, helping the kids to lessen their fears and control their behaviour. At some point, most children will experience some degree of separation anxiety. Typically, parents notice the first episodes of such behaviour when their babies are between 6 and 12 months old, and while this passes quickly for some babies, others can take several months before they are completely comfortable leaving their parents, even for a short while. Once that first round of anxiety has passed, parents may feel a sense of relief, happy to be past one of the first hurdles of parenthood, but at about 18 months, separation anxiety often crops up again, this time in an older (and even more opinionated!) child. Child development experts agree that this behaviour is to be expected and is rarely indicative of a problem with the caregivers, yet knowing that it is normal rarely eases the stress levels of parents as they are forced to leave their child, who may be screaming and begging to go along. Sometimes, older children experience bouts of separation anxiety, but this is not as common as it is during the first few years of life. Older kids and even teens may suffer Separation Anxiety Disorder or another type of anxiety disorder, so parents who have concerns about their children’s anxiety levels may wish to consult with their GP for advice. When properly diagnosed, anxiety disorders are highly treatable, enabling kids to better participate in pleasurable activities. Separation anxiety stems from young children’s inability to understand that their parents will return to them, so it is natural that they object to seeing a parent leave. 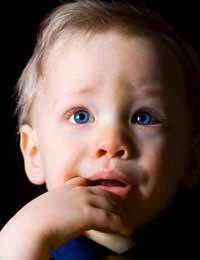 Very young babies are only able to relate to people or objects that are within eyeshot. When parents walk away from a newborn, the child doesn’t object because they have not yet mastered the concept of object permanence – they don’t give a thought to the missing parent until they are together again. As babies mature, however, they begin to understand that something still exists when they don’t see it, so they are likely to get upset when their parents walk away. Unfortunately, it takes a while before young children also understand that separation is temporary and that at the end of the day, their parents will return. Until they are able to be comfortable when separating from their parents, caregivers need to provide gentle assurance to anxious kids. While they may object at first, reassuring hugs and soothing words can help kids to calm and redirect their attention to a fun activity. Well chosen game playing can help babies and young children to understand that their parents can “disappear” and “reappear,” making it easier for them to separate when necessary. Games of peek-a-boo are often fun for babies and toddlers, and help to reinforce the concept of object permanence, as well as building memory skills. Practicing departures and returns can help to ease separation anxiety for some kids. Parents can walk out of the room and then quickly peek around the corner to show their children where they are. In the beginning, parents should “reappear” immediately, but should allow the time to get progressively longer with each appearance, so that kids lean to wait, but understand that their parent will, in fact, be returning. As difficult as it can be for parents to walk away when their children are reaching out for them, quick and cheerful goodbyes are the best way to handle dropping off at day nurseries. When parents prolong their departure, the children tend to get increasingly upset, making it harder for them to calm down. The distress that their children are feeling usually subsides quickly once their parents have gone, but even knowing this, it can be stressful to leave a child who has a problem separating. Caregivers should do all that they can to discourage parents from lingering, though, since although they are well-meaning, they are actually prolonging their children’s discomfort.